Beavers have set up a grooming station, on one of the floating platforms at Silver Lake, most nights since August. Beavers regularly move between aquatic and terrestrial environments, and the extended time in the water requires careful maintenance. Beavers spend a lot of time grooming their fur when out of the water, and the floating platform provides a convenient location for hauling out. Often when grooming, a beaver sits upright with its tail extended in front between its hind legs. This allows access to the oil and castoreum glands on either side of the cloaca. The beaver uses its front paws to gather water-proofing oil from the oil glands and rubs the oil into its fur. This waterproofing oil helps in the insulating character of the beaver’s fur. 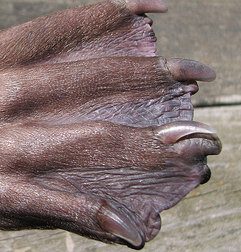 The hind feet also have a preening toe, the second from the inside, with a unique double toenail. They use the preening toe as a comb to prevent their fine, soft fur from matting to maintain its waterproofing and insulating properties. These flexible toes also remove burrs and parasites. In this video there is a lot of grooming activity. The family group often help each other with grooming the hard to reach parts of their fur. The Conservancy posted this video with a mother beaver and two young beavers exhibiting a variety of grooming behaviors.